An n-gram (also called multi-word unit or MWU) is a sequence of number of items (numbers,digits, words, letter etc.). In the context of text corpora, n-grams will typically refer to sequences of words. A unigram is one word, a bigram is a sequence of two words, a trigram is a sequence of three words etc. The items inside an n-gram may not have any relation between them apart from the fact that they appear next to each other. What’s the difference between n-grams and collocations? A collocation can be an n-gram if the words are found immediately next to each other. The study of n-grams is important for machine translation (frequent n-grams can be translated as chunks with correct word forms reflecting the surrounding items in the n-gram rather than a sequence of isolated items) or in language learning (frequent n-grams can be learnt as chunks rather than constructed from the individual items each time the student needs to use them). First, you have to choose a corpus and then click on Word List in the left menu. Here you can choose an attribute (Search attribute), which it will search. The important thing is to tick off “use n-grams” and set the value of n (automatic is 2, maximum is 6). 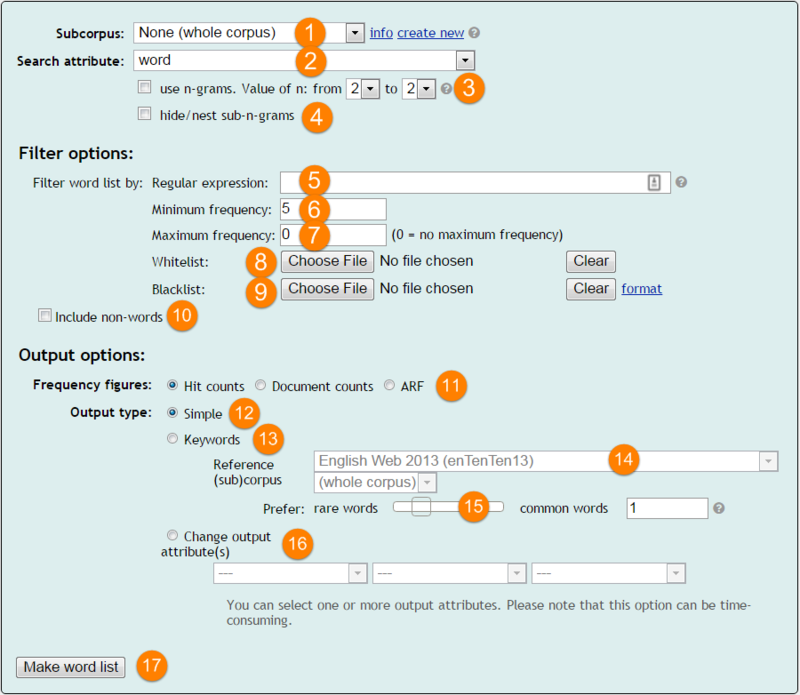 Clicking the button “Make Word List” below shows you n-grams according to the selected option. Creating n-grams can take several tens of seconds (especially 5- or 6-grams in large corpora).